The name itself nowadays leads to a lot of question and misunderstandings. Is that a kind of riding just for people who have studied? Can you pass an exam there? Do I need a special horse for that, e.g. a P.R.E.? Am I only allowed to ride with a curb? The Academic Art of Riding is nothing newly invented, it is something very, very old. 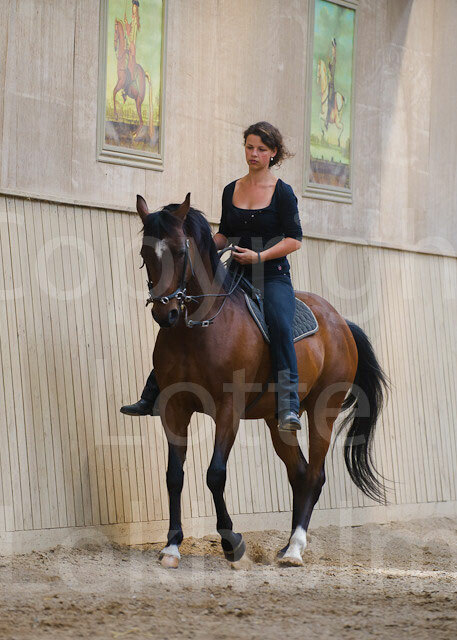 It is the knowledge about the art how to educate a horse and a rider in the most logical and easy way. Its guideline since thousends of years is to stay within natural boarders. In former times, this knowledge was easily passed from generation to generation, in between master and student. After a very unsettled century and a lot of wars at the beginning of the 20th century, this chain of the traditional pass on of knowledge broke up and most was lost. As names out of more modern times you may be familiar with e.g. Egon von Neindorff or Bent Branderup, continuing and upbuilding the long lost tradition of Academic Riding. Neindorff was one of the last riders and teachers able to pass on knowledge, and one of Bent Branderups masters. For Bent, it became a liftime project to gather as many pieces of knowledge as possible and use them for accessing long lost exercises again. In addition, Neindorff's idea of reviving the old Knighthood was passed on to Bent by his master, and nowadays we are in the middle of that process. Bent Branderup again is for sure for me personally my most important teacher and master. As one of the liscensed Trainer, it is my duty to pass on knowledge to future generations and to not keep it to myself. The goal of a teacher should always be the wish to shape independent and fully responsible and mature students, who can become in very best case a teacher themselves again. Originally the Art of Riding was taught in Academies for noblemen, like foreign languages, mathe and fencing as well. Therefore, the "Academic" within the name explains itself. Everybody interested with each horse, not depending on age, colour, breed, malpositions or whatever is welcome to deal with the Academic Art of Riding (and no, it does not have to be spanish horse, and yes, a pony is fine, too.....). The journey is the reward - and the journey can be very long, but as well very exiting and satifying. To reflect one's own abilities and ideals every day, and have enough courage to look into the mirror that my horse is giving me every day and every minute, continue the journey of horsemanship becoming art - is my personal interpretation of the art of riding.